Solar water pumps are often used in remote areas where the cost of running traditional water piping is cost prohibitive or you just want to provide water to an off-grid home. 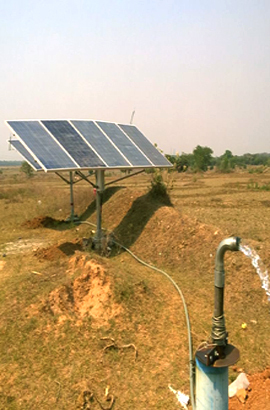 Solar water pumping systems are also used to pump water for livestock and crop irrigation. Submersible Solar Pumps can lift up to 650 feet and fit in a 4" or larger well casing and are used when the water supply is more than 20 feet from the surface. Submersible solar pumps can operate directly off solar panels, batteries, or in some cases, an AC power source. The solar panels powering the solar water pump are sold separately. Each manufacturer provides a graph or table showing how many watts of solar panels are needed to produce the desired water flow. Once you have selected the appropriate type and size of solar pump.